This product requires the base game Northgard. Slavery is an important part of the clan's economy. Like the regular civilians, thralls can travel in neutral territory and fight. After getting the Capture Lore, you'll be able to enslave other faction's people. The Clan of the Dragon starts each game with an already built exclusive building: the Sacrificial Pyre. Through this building, you'll be able to send every unit you have to be sacrificed to honor the gods and gain their favors. 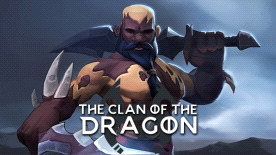 The Clan of the Dragon does not have access to the regular Military Building. The only military camp you'll be able to build is the Dragonkin Altar. Each Altar increases your warband size by 1 (2 if upgraded).